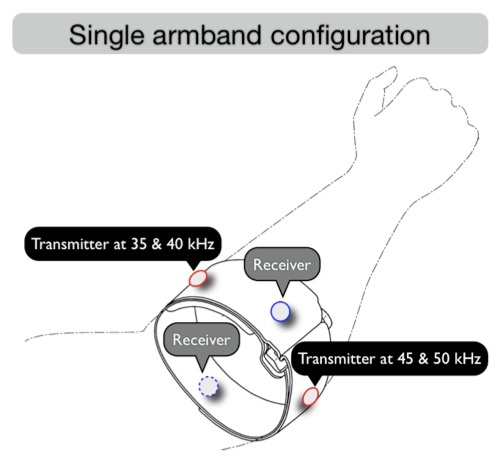 We leverage the phenomena of transdermal ultrasound propagation by prototyping on a wearable system that emits ultrasound signals on one part of the body and measures this signal on another. The measured signal varies according to the measurement location, forming distinctive propagation profiles which are useful to infer on-body touch locations and on-body gestures. We developed a proof of concept sliding menu application, which also served as our experiment platform in our interactive study. 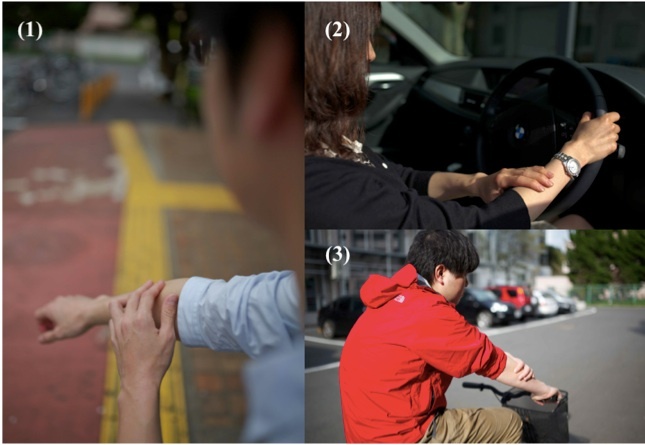 In this study, we investigated event mapping for continuous and pressure- aware touch gestures. 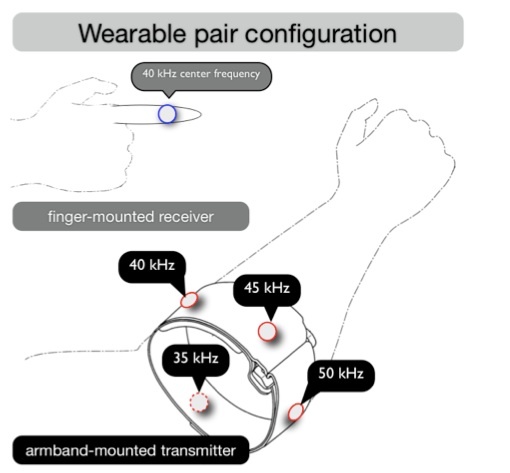 Note that in the future, the sensor unit (transmitter and receiver transducers) and the display contents can be embedded into wearable devices enabling truly mobile experience. We envisioned two exemplary application domains in which our approach can be immediately useful: 1) supporting interaction modalities for visually impaired users (who can accurately touch their own body parts using proprioception, as illustrated by the following figure (1), and 2) for users with limited access to an input device (illustrated by (2) and (3), e.g. when driving, biking, running, etc.). Other interactive application examples uniquely enabled by this technique includes: a) Wrist mounted mobile phone will embed the sensing unit and appropriates the forearm to be an input surface, b) Headphones that simultaneously plays music and transmits ultrasound signals through the skull, and s/he may touch different parts of the head/neck/face to control the music, c) Multiple sensors placed in various body parts can be used to sense wide-body gestures.